First, I’d like to give a shout out to a fellow blogger who does a really great post every week called “Tell ’em Tuesday”. K at peeledwellness.com invites fellow bloggers to share their own blog posts on her site. The following week she highlights her favorite and the post that received the most clicks. I love this because it allows me to share my recipes with other folks who I might not reach otherwise. I also find a lot of great recipes! It’s like a mini version of Pinterest for me 🙂 If you’re a blogger, or if you just love good food like me, I encourage you to check K’s site out! Now that it is officially spring here in Chicago, it’s BBQ season! A week ago Sunday was supposed to be beautiful here, so I proposed a get together with some of our dearest friends. Since we don’t have a good grilling space at our apartment, we left our grill years ago at their place. Everything was going to be perfect: the menu was set and additional friends were invited. The one thing we didn’t plan on was evening storms. Que Sera, Sera! We made the most of it. Burgers and brats can still be cooked inside! My contribution to the party? My favorite summer pasta salad! It’s both sweet and savory, and has always been a crowd pleaser. The best part? It doesn’t take much time to whip together! 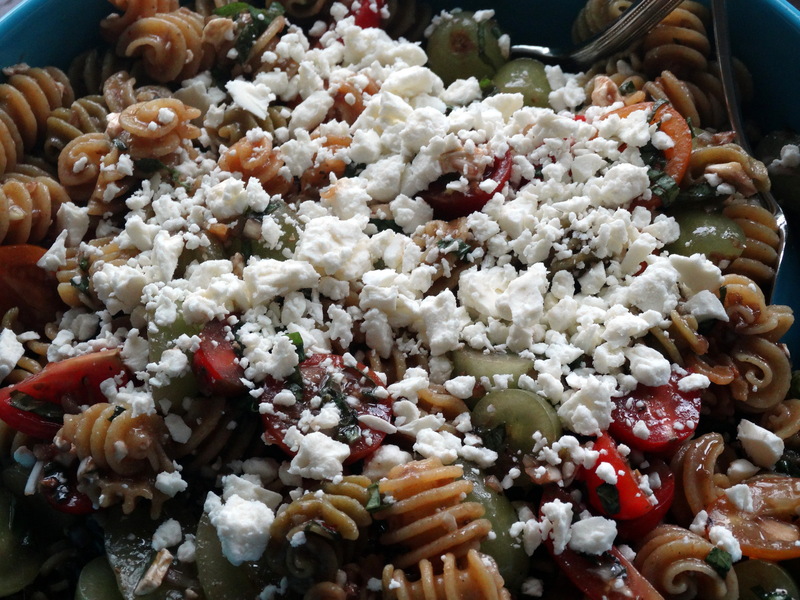 You will need pasta, grape tomatoes, seedless green grapes, fresh basil, balsamic vinegar, a shallot or two, Dijon mustard, a clove of garlic, coarse sea salt, freshly ground pepper, olive oil, and last but not least, feta cheese. Start by bringing a large pot of water to boil. Once you have a nice, roiling boil, add 8 ounces of your favorite pasta and cook until al dente. I prefer a more textured pasta such as rotini or radiatori, which helps capture the tasty dressing in its crevasses. I also used a gluten-free pasta, but you can use whatever you like best. 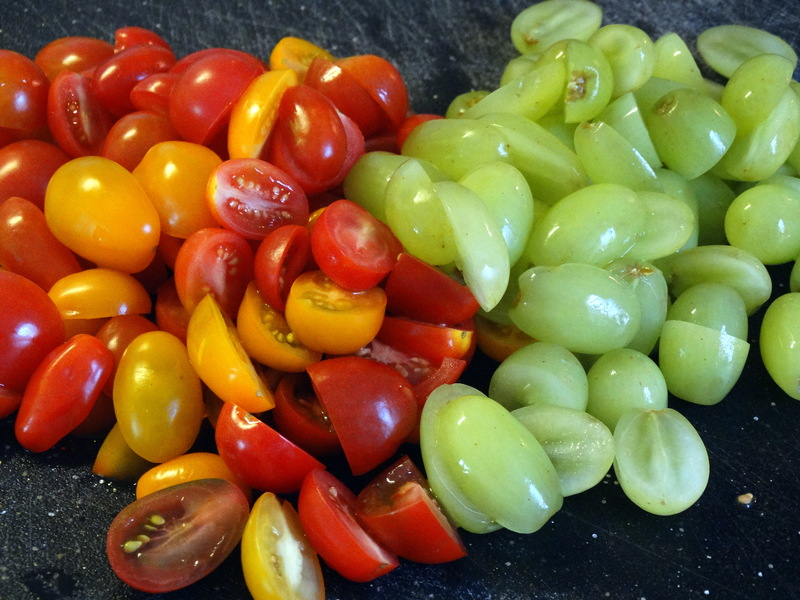 While your pasta is cooking, wash and slice 2 cups grape or cherry tomatoes and 1 cup seedless green grapes in half. 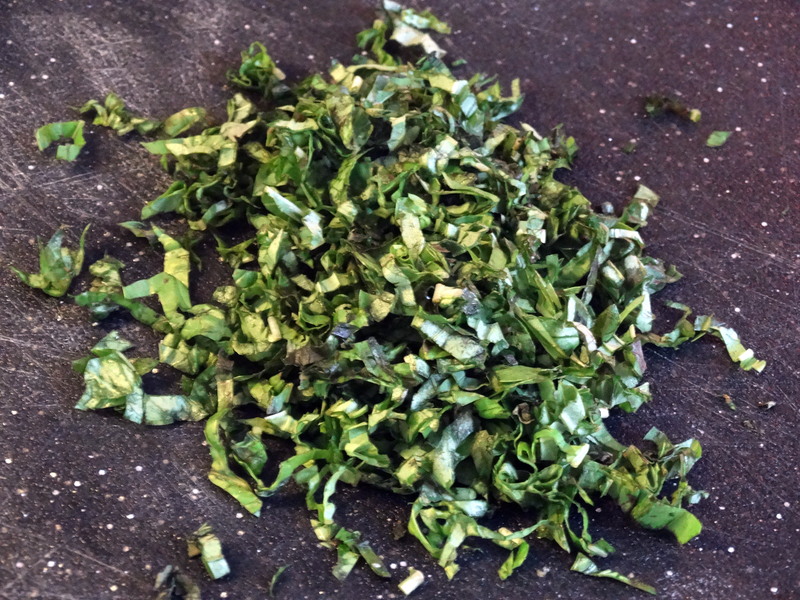 Wash and thinly slice 1/3 cup fresh basil leaves. Combine 2 tablespoons balsamic vinegar, 2 tablespoons minced shallot, 1 teaspoon Dijon mustard, 1/2 teaspoon minced garlic, 1/2 teaspoon coarse salt, and 1/4 teaspoon freshly ground pepper, and 4 tablespoons olive oil in a small bowl with a whisk. In a large serving bowl, stir together the tomatoes, grapes, and dressing. When the pasta is done cooking, strain it and run it under cold water. Once cool, add it to the dressing mixture and stir to combine. Top with 4 ounces of crumbled feta and you are good to go! Keep it in the refrigerator until ready to serve. Enjoy! 1) Bring a large pot of water to boil. Once you have a nice, roiling boil, add 8 ounces of your favorite pasta and cook until al dente. 2) While your pasta is cooking, wash and slice 2 cups grape or cherry tomatoes, and 1 cup seedless green grapes in half. Wash and thinly slice 1/3 cup fresh basil leaves. 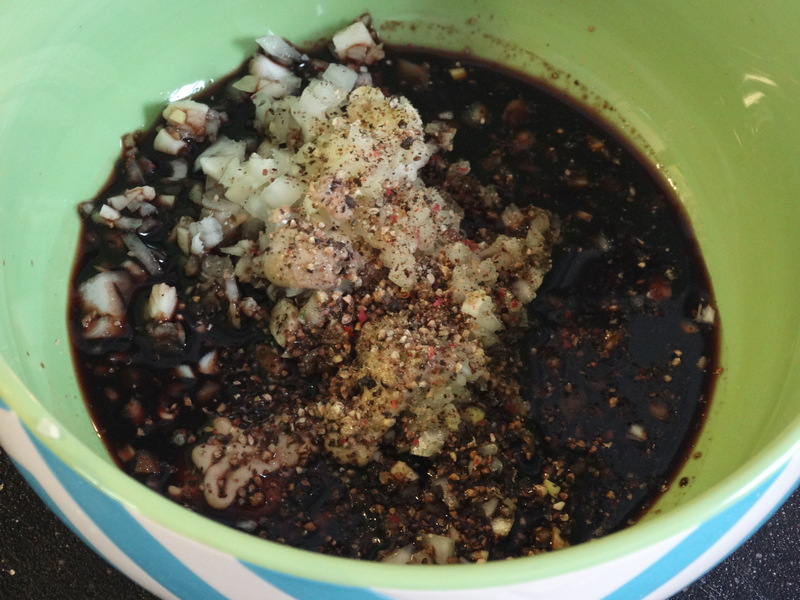 3) Combine 2 tablespoons balsamic vinegar, 2 tablespoons minced shallot, 1 teaspoon Dijon mustard, 1/2 teaspoon minced garlic, 1/2 teaspoon coarse salt, and 1/4 teaspoon freshly ground pepper, and 4 tablespoons olive oil in a small bowl with a whisk. 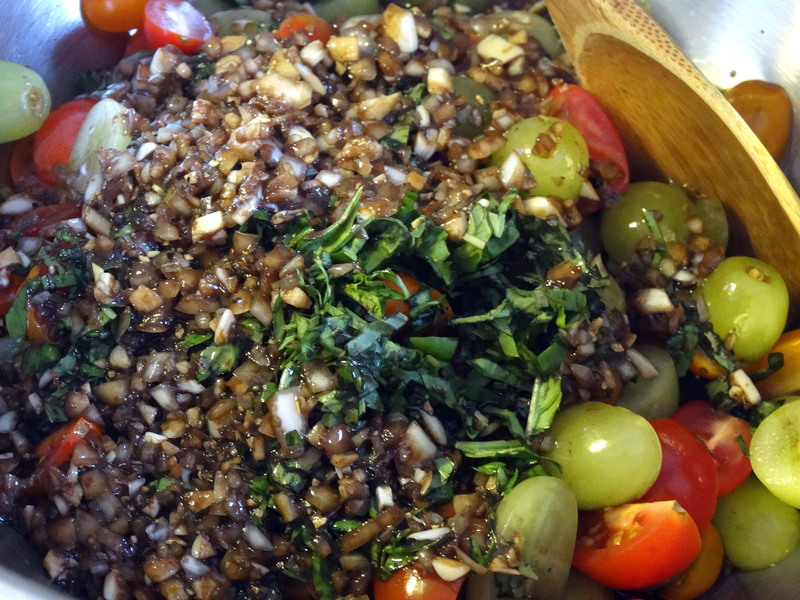 4) In a large serving bowl, stir together the tomatoes, grapes, and dressing. When the pasta is done cooking, strain it and run it under cold water. Once cool, add it to the dressing mixture and stir to combine. Top with 4 ounces of crumbled feta. Keep it in the refrigerator until ready to serve. Enjoy! Hey Marta! I was totally sold when grapes and feta were mentioned in the same post. Thanks for linking up on Tuesday! I love sweet and savory dishes! I think my summer most definitely needs this salad! Thanks for sharing! 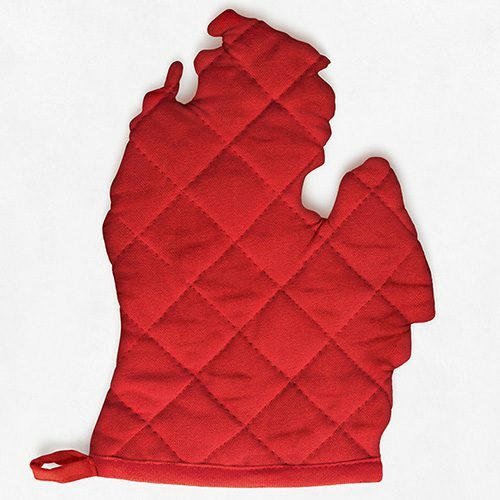 I live in Michigan and know how unpredictable spring can be. I’m so ready for summer! Glad you were able to still pull off your BBQ plans even if it was inside! This looks like a good recipe for a Memorial Day picnic! That’s what I’m thinking! Enjoy! Looks like a great summer salad recipe! Can’t wait to try it! I love K’s link-ups too! It’s helped me find all sorts of wonderful bloggers and delicious sites, like yours! This looks amazing! Her link-ups make me look forward to Tuesday every week! Thanks for visiting!